Will The Sprint T-Mobile Merger Pass Regulatory Muster? Sprint (NYSE:S), the smallest of the four U.S. wireless carriers, is expected to publish its Q3 FY’18 results on January 31, reporting on a quarter that has seen major carriers post robust postpaid wireless phone gains. Below we take a look at some of the key trends we will be watching when the company reports results. We have created an interactive dashboard that outlines our expectations for Sprint over 2018 as well as fiscal 2019. You can modify the key drivers to arrive at your own revenue and EPS estimates for Sprint. Will The Postpaid Phone Business Continue To Face Pressure? Sprint lost 34,000 postpaid phone net customers over Q2 FY’18 (third calendar quarter) after several consecutive quarters of net additions with its postpaid churn also trending higher, coming in at 1.73% in Q2 FY’18, up from 1.59% in the year-ago period. It’s possible that the pressure could continue over Q3, as the company noted that it could see seasonal churn pressure of 15 bps sequentially. 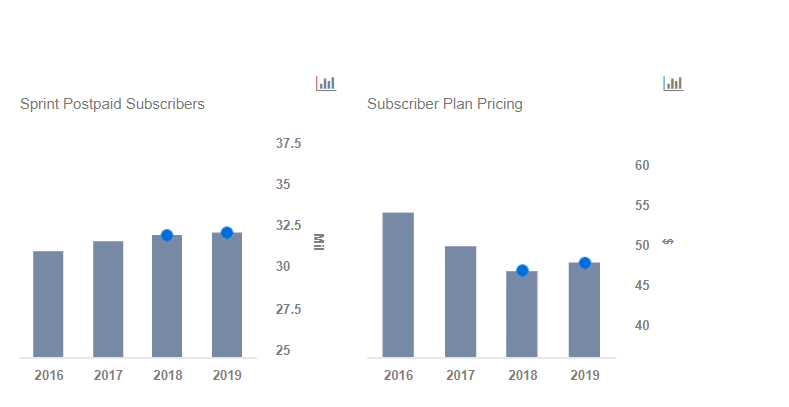 There are multiple factors impacting the company, including gradual saturation of the postpaid market, a relatively negative perception of its network quality compared to larger rivals, and a likelihood that customers rolling off its past promotions will leave the carrier. Moreover, competition is also likely to have mounted over the holiday quarter, as both Verizon and T-Mobile posted stronger-than-expected postpaid phone net additions (650k and 1 million postpaid phone adds respectively). We will also be watching the company’s ARPU closely. While Postpaid ARPU declined by 2% year-over-year to $45 during Q2 FY’18, they saw a sequential increase over the last two quarters. It’s possible that the sequential trend could continue, as customers roll off lower-priced promotions and as Sprint looks to add more customers to its Unlimited Plus and Unlimited Basic plans, which are priced higher than its legacy plans.